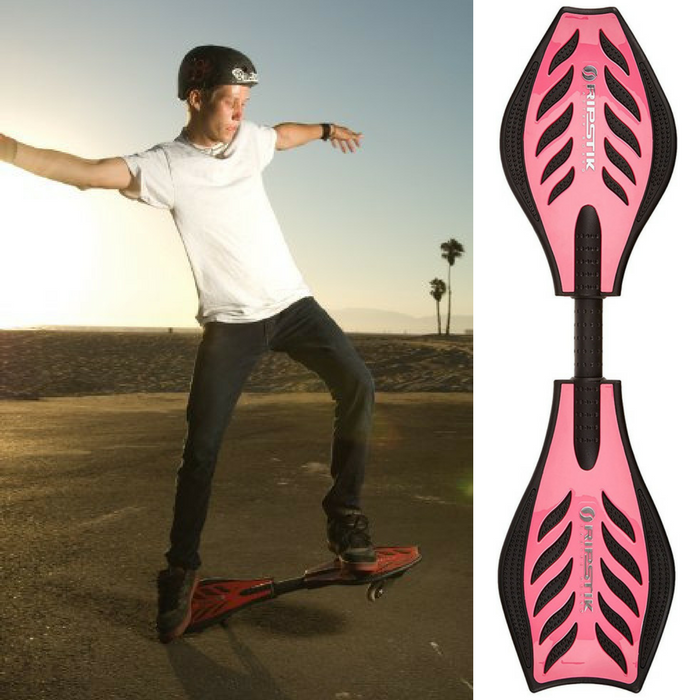 RipStik Caster Board Just $31.89! Down From $100! PLUS FREE Shipping! You are here: Home / Great Deals / Amazon Deals / RipStik Caster Board Just $31.89! Down From $100! PLUS FREE Shipping! Amazon has this RipStik Caster Board on sale for just $31.89 down from $99.99 PLUS FREE shipping! The new Ripstick combines all the fun and excitement of surfing and snowboarding and puts it on wheels. Inspired by the classic shape and design of a skateboard, the Ripstick looks like something out of the future. Instead of the traditional four-wheel skateboard, this amazing board can make smooth, quick 360-degree turns on just two wheels. Just stand on the sturdy traction plates and subtle movements propel the Ripstick even up a hill! The front and rear flexible panels are controlled by a spring-oriented bar located on the top of the wheels. The rugged polyurethane wheels are 77mm/85A with ABEC-5 bearings. Separating the two traction plates is a padded rubber carrying handle.